Daffodils. Daffodil Day is August 28 and is a day to raise funds for cancer research, prevention and support services. Kikki.K Happiness Journal - I got this around Christmastime from my lovely friend Holly and love it. It breaks down each month into objectives and goals and I find it really useful for accomplishing both big and small goals. The Princess Diaries: Royal Wedding. I've just started reading it and am loving reconnecting with Mia - reading that series was so important back in high school and it's nice to have her back. 15 Minutes After 5 Years by Scarphelia. Katie's honesty with her readers is so inspiring; her blog is truly like a diary. I cannot recommend Scarphelia enough. Anthropologie Hinged Hanging Picture Frame - I just got one of these and love it although it's really difficult deciding what should go in it! Spirituality - spiritual card decks in particular. I picked up Chakra Wisdom Oracle Cards and Fortune Reading Cards and am loving them both. The craziest thing happened with the Chakra cards - I was looking through each one when I first got them so I could make a connection with them and one card immediately reminded me of my mother - it was the Guilt card. The next day my mum asked me to do a reading for her so I was shuffling them as normal and one card flipped in the deck; it was the Guilt card. I love when I feel in tune with a card deck, it's so satisfying. Typo Wooden Marquee Light - I don't know where I would put this if I bought it but I can't stop myself from wanting to buy it. The Wanderlust of #Vanlife. Wanderlust is a very big trend at the moment and has been for years. I love the idea of driving out to the middle of nowhere, leaving the real world behind, and connecting with strangers. Although I might be too much of an introvert to sleep in a van with numerous other people. Diary of a Fangirl by Girl Lost In The City. I'd love to hear what you've been loving - leave any suggestions in the comments (particularly for videos and small documentaries; I'm loving those right now). I love reading posts like this and the photographs you take are absolutely beautiful. 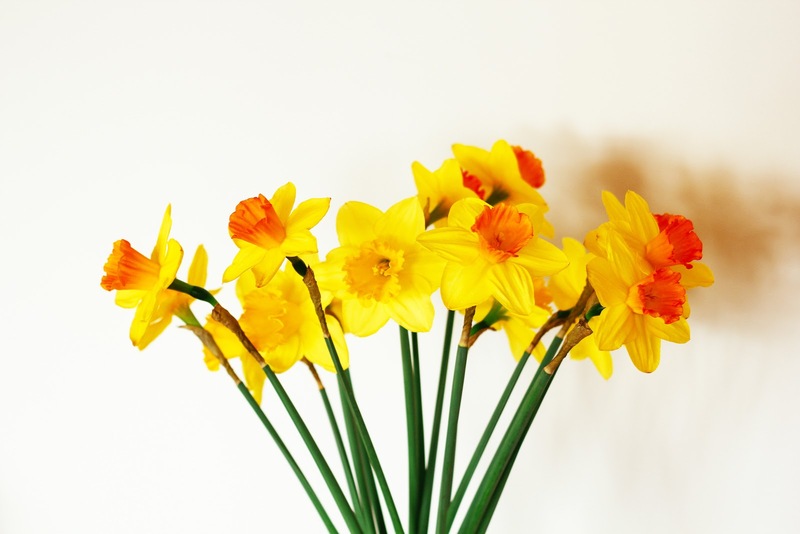 I love all bright coloured flowers, but daffodils are one of my absolute favourites!